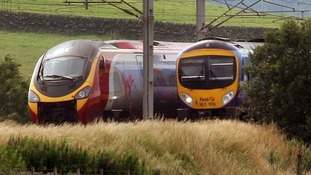 A senior MP has demanded sweeping changes to the civil service amid the fiasco surrounding the West Coast Main Line, which connects London with cities in the West Midlands, the North West, north Wales and Scotland. Labour MP Margaret Hodge, who chairs Westminster's powerful Public Accounts Committee, said the embarrassing and costly debacle exposed flaws in Whitehall processes. She called for "proper accountability" to "raise civil servants' game" and improve quality and standards after three Department for Transport (DfT) civil servants were suspended following the Government's U-turn which will cost taxpayers at least £40 million. FirstGroup was expected to take over the franchise from Sir Richard Branson's Virgin Rail. But Transport Secretary Patrick McLoughlin scrapped the deal, admitting the DfT made "unacceptable mistakes" in managing bids - and laid the blame "wholly and squarely" on civil servants. Mrs Hodge said: "It exposes in a very stark way that the present conventions on accountability between civil servants and ministers to Parliament and the public aren't working. It's yet another example ... of where the civil servants themselves have not really captured and taken on the role that is expected of them in today's society. "People came into the civil service in the past because they were interested in policy, they wanted to devise policy. Today, the job of a civil servant is much more about delivering programmes, and that requires a different set of skills." Mrs Hodge's call came as Scotland's Transport Minister Keith Brown prepared to make a statement on the "shambolic" cancellation of the West Coast contract, which has sparked two independent inquiries. Mr Brown complained the Scottish Government was not warned of a decision which affects the country. "This is a shambolic situation that affects thousands of passengers in and out of Scotland," he said. "I will do everything I can within our current limited powers to help minimise any uncertainty and disruption for them and I urge the Department for Transport to sort out this horrendous mess and do the same." Former cabinet secretary Lord O'Donnell, who retired last December, admitted the West Coast fiasco "does raise some issues about skills in the civil service". He said civil servants who made mistakes should be held accountable, adding: "There are civil servants up and down the country doing great jobs, but we are suffering some areas where there are skills shortages, in the commissioning area, in the procurement area."